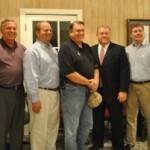 Tuesday’s Trussville City Council meeting was bittersweet, as it was the last meeting that Council President Wayne Taylor and Councilman Buddy Aydelette would attend in their current positions. The new council members will be sworn in Monday, Nov.5 at 6:30 p.m. in the Trussville Civic Center by Justice Tom Woodall. Councilman Brian Plant said he was honored to work with Taylor and Aydelette. Looking ahead at the future of the city, the council has many things on its plate. While the leadership in the city is strong, public input about the future of the community is also important. The city is hosting a public forum on its Downtown Master Plan Oct. 26 at 7 p.m. at the Trussville Civic Center. 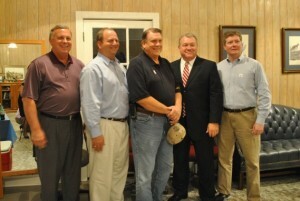 “We look forward to the fruition of the plan and seeing what happens down the road,” Plant said. During the regular meeting, the council unanimously approved a resolution to give Mayor Melton the power to make decisions about the Linden Street curb project. The resolution covered the landscaping needs after the new curbs and gutters are put in place. Many homeowners’ yards on the street have been damaged by the project, and several properties have had flooding in the backyards. The city agreed with the property owners to fix the damages. The landscaping will be covered through the project’s funds up to 10 percent or $44,900, with no cost to the city. The council believes the costs will not add up to that much. Any changes the mayor makes will be brought before the council for ratification. In other council news, updates were given regarding the current construction projects in Civitan Park. The project in progress, named Trail H, has been slowed down due to recent rains and is still in the building phases. According to reports, the project, which is under the supervision of the Alabama Department of Transportation, will be completed in the spring.